Zulu Investing is a GARP investing style which uses a combination of growth and value, looking for shares where brokers are forecasting high earnings growth, but which are currently valued at a price that is low relative to their forecast earnings. As Slater puts it: "I have always been attracted to growth shares, particularly those that can be purchased at what I perceive to be a discount to their proper value”. Jim Slater is a UK investment guru who specialises in growth investing. He believes growth shares to be the most rewarding investments, with unlimited upside if the right companies are picked. Slater originally rose to prominence with a share column, “The Capitalist” in the Sunday Telegraph. In 1990 he published his book articulating the strategies and investment criteria that underpinned its success. He called the book The Zulu Principle to illustrate the importance of specialisation, the key to his investment strategy - the name was triggered when his wife started to read up on Zulus and quickly became an expert. “Most leading brokers cannot spare the time and money to research smaller stocks. You are therefore more likely to find a bargain in this relatively under-exploited area of the stock market. A prospective price-earnings ratio less than 20 – “the preferred range for a P/E is 10-20 with forecast growth rates of 15-30%”. He is wary where growth exceeds these levels, as that sort of growth rate is usually unsustainable. The Zulu Graphic History chart very clearly suggests that the Zulu Principle is a FTSE beating strategy. Since inception, the Zulu stocks have outperformed the FTSE by 63%! However, do we think that this is inevitable given that a stock needs to have strong relative strength in order to filter through the stock screen in the first instance? In other words, a stock already needs to be a winner in order to be a Zulu stock. I was wondering if its possible to run a stock screen which identifies the stocks that would have qualified for the Zulu screen say one year ago and see how they performed? Ie, can we run a stockscreen that allows us to filter by low PEG ect, but in a way that picks up companies that had low PEGs not today, but one year ago? This would allow us to further explore the strength of the Zulu approach. I answered you by email - but the chart shown is the actual historic chart of qualifying stocks at the time. We rebalance the held stocks in the tracked portfolio quarterly. The latest rebalancing was this week - so the currently held stocks match the current qualifying set shown on the screening page. Over the next quarter this set of stocks are tracked in the price chart. Hope that makes sense. There are lots of help articles to explain this more fully linked to from the screen page. Thanks Ed, especially for getting back so quickly! This is really helpful. So just to clarify, at the start of each quarter, stockopedia reselect/rebalance the stocks; these are tracked for one quarter on the chart. Then in the next quarter, another set of stocks are selected and tracked, and so forth. I guess my next question is related to the rules of the Zulu stock screen. Looking at the ‘mandatory criteria’ listed above, Slater looks for an OCF/EPS ratio greater than 1, in addition to good operating margins and low debt. However, the ‘Zulu Principle’ rules do not take account of OCF/EPS ratios or operating margins. These rules can of course be added through the ‘fork it’ tool, but I was wondering why the Zulu screen didn’t take account of cash or operating margins. 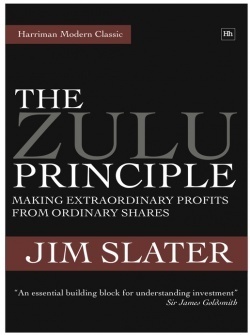 I am a keen fan of the Zulu principle and i have been investing since 1974. Now at last I have more time for private investing and hope to improve my portfolio performance even more. The article is well written interesting, and of course true. TP. I like the Zulu principle. Looking at the screen on here, it performed very well upto end of 2013, since then it has been flat. It does seem to pick a few more risky shares like Wincanton (LON:WIN), Globo (LON:GBO), I do hold 6/20 on that screen, interesting that some have low SR although I think one is due to a merger Gama Aviation (LON:GMAA) so that maybe adjusted when the next results are published. Can you tell when Staffline (LON:STAF), was demoted from the screen? Not so much a question just on this strategy but it would be interesting if you could find out from Stockopedia's followers how many might confirm they have followed an unchanging strategy for, say, 10 years or more and how their real results may have varied? This is triggered mainly by a discussion I had with Jim Slater many years ago, but some years after his famous book, and he was finding that the strategy was having to change with the changing times - perhaps not surprising? My interpretation of his book ( not unlike the screening tools on this site) is that it a method for finding the stocks to then really consider). Then choose also on qualitative measures: good management, growth sector, etc. etc. To my mind there are always a couple of approaches. You can filter for many, then allocate a proportion of your capital to them all (ensuring that you don't miss any prize fruit, but also being aware that you might get the odd bad apple). on a smaller number of stock if it goes well, it will get good performance. You can of course do a mixture of both, with the ratio varying depending on experience and confidence (and time to do the homework). And Alex, with the tool you can define your own Zulu "type" Screener with all the criteria you need, or want in. With regard to back testing the "Zulu Principle" even if it comes out good (or flat as someone mentioned above) I'm sure Jim Slater would have done better, as he would have used his vast experience, skill and insight, to produce the icing on the cake. And he would have kept learning and adapting his method, as johread mentions. I'm not trying to put him on a Pedestal. He was obviously a Great Investor (and obviously also a great teacher). Someone else who I'm currently reading, as I'm sure many others have/are (also mentioned on this site via interviews and reviews, etc.) is Mark Minervini, who gives much less weight to PE and PEG in his strategy and thinking. So, to my thinking, it seems to be about being disciplined enough to stick to your own set of rules whilst actually trading, but flexible enough to adapt your rules based on your own review and analysis of your own performance and results over time. As you re-balance each quarter. Is there anyway to see what stocks are actually being tracked for the quarter?